June is National Fresh Fruits and Vegetables Month and it's right around the corner! The weekends will be filled with barbeques, beer-b-ques, showers, graduation parties, and everything in between. During the week, everyone will be pondering the burning question: what to bring? This year, bring a Japanese treat! With endless easy, healthy recipes that are a perfect accompaniment to grilled dishes, Japanese cuisine is light and fresh - a nice side to heavy meat dishes or an alternative to chips and dips. What's more, Japan is known for its fresh, delectable produce. Dozens of varieties of mushrooms, shapely tomatoes, foot-long radishes and more make it easy to make a neat dish with a Japanese twist. Below is a recipe by Chef Tony Sakakibara of Mitsuwa Marketplace in Torrance, CA. Mitsuwa Marketplace is the largest Japanese supermarket in the United States, housing thousands of Japanese products that are fun and easy to cook. With 7 locations nationally and an online store, Japanese ingredients - including a cornucopia of produce - have never been easier to come by. And if grilling meat is on the food shopping list, Mitsuwa also has a top-notch meat counter for all carnivore needs. 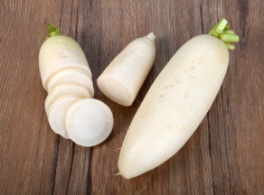 Cut the daikon to match the length of the seaweed, then slice into small pieces and cover with salted rice malt. Store overnight in refrigerator. The next day, wipe off the salted rice malt. Cook the Sato’s rice as per instructions on package and add sushi vinegar. Take plastic wrap and lay the seaweed flat. Spread the rice on top of the seaweed and sprinkle sesame seeds over it. Cut the Ohba leaves in half vertically and place on top of the seeds. Place the daikon over the leaves. Use the plastic wrap to roll up the layers. Once rolled up, cut into six pieces.